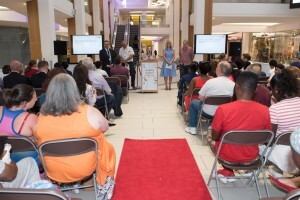 Adventurous intu volunteers and pupils from Nottingham Academy were celebrated for their determination, perseverance and achievements this month during a presentation evening held at intu Victoria Centre. Earlier this year, intu team members mentored Nottingham Academy pupils during an outdoor learning experience in Wales. The unique Outward Bound programme encouraged pupils to step out of their comfort zones and build their confidence through experiencing a real adventure. This is the fourth consecutive year intu has sponsored the Outward Bound residential programme for pupils from the Academy, asking team members to get involved by becoming mentors to support pupils during the outdoor learning experience. Two team members from intu Victoria Centre plus two from intu Broadmarsh joined the 12 and 13 year old pupils as mentors throughout the Outward Bound programme, which included challenging outdoor activities such as an overnight expedition, abseiling and canoeing. Thirteen-year-old Megan King took part in the Outward Bound Programme and said the experience was a great way to build confidence: “I am so pleased I applied to take part in Outward Bound and that I was selected for the experience, it feels special to be part of something like this. Ged Rae, Principal at the Nottingham Academy, said: “We are incredibly grateful to intu Properties who have made this Outward Bound course possible. Their continued investment over the last four years has allowed us to find new ways to take young people out of their comfort zone: challenging themselves, developing character and interacting with a range of different adults and peers.